:: The film "A Day Without a Mexican"
:: La película "Un día sin mexicanos"
Quick on the heels of the massive :: March 25th mobilizations and the :: student walkouts during the following week, :: April 10th, 2006 was a historic day of action for immigrant rights across the USA. "The Great American Boycott" on May 1st will show the next. The Government of the USA plans to implement the "Border Protection, Antiterrorism and Illegal Immigration Control Act of 2005" (:: HR4437), also known as Sensenbrenner's or anti-immigrant act HR4437, which would make 12 million undocumented people in the United States into felons as well as anyone who aids undocumented people in anyway. HR 4437 is a bill designed to "shut down illegal immigration." It calls for the construction of a two layered fence along 700 miles of the US Mexico border. It additionaly mandates for the departments of Defense and Homeland Security to draft plans on how to use military technology to stop border crossings. In March 2006 around 3 million people participated in demonstrations and different kinds of actions across the US against HR 4437. Between 500,000 and 1 million people filled the streets of downtown Los Angeles on :: March 25th, 2006 on its own. On April 9th and 10th 2006, immigrants and their allies gathered in cities across the US (the slogan '100 demonstrations in 100 cities' was given out) to oppose the harsh and unworkable House Resolution 4437, and call for the full enfranchisement of all immigrant workers. These protest built on several weeks of mass protest on this issue in what amounts to the largest display of decentralized, coordinated protest in US history. tens of thousands of people took the streets in Los Angeles [ :: 1 :: 2 ], and in :: Santa Ana, while 5,000 marched in :: St. Louis, 10.000 participated in :: Oklahoma, 15,000+ at any one time in :: Salem and :: Nashville, and 10,000 raised their voices in the largest march in :: Fresno's history. :: San Diego also made history with a march of up to 100,000 people on April 9th. There were mobilizations in the :: Bay Area, in :: Tennessee, in :: Rochester, NY, and in :: DC. In :: Portland, up to 8,000 marched, while thousands gathered in Love Park in :: Philly. Allies mobilized in :: Pittsburgh. In Arizona, people were on the move in :: Flagstaff. There were major marches and actions in :: NYC and :: Boston, and Houston Indymedia provided a :: blow by blow of actions in Texas. In :: Charlotte people organised a Boycott for Immigrant Rights. On 6th of April 2006 proposed compromise legislation stalled in the Senate. Protesters say they seek real immigration reform that is comprehensive, respects civil rights, reunites families, protects workers, and offers a path to citizenship for the current undocumented and future immigrants to the US. The US Congress has been forced to :: backpeddle on brutal anti-immigrant legislation, but they are nowhere near to meeting the :: demands of the movement, especially amnesty for all. So the movement for immigrant justice keeps rising, with more major actions planned in the coming weeks: :: April 15th is a student day of action, and :: May 1st will be "The Great American Boycott" - a historic day of action, with calls for a general strike, boycott, no sales or purchases, walkouts, marches, and actions in financial centers and at anti-immigrant corporations throughout the country. 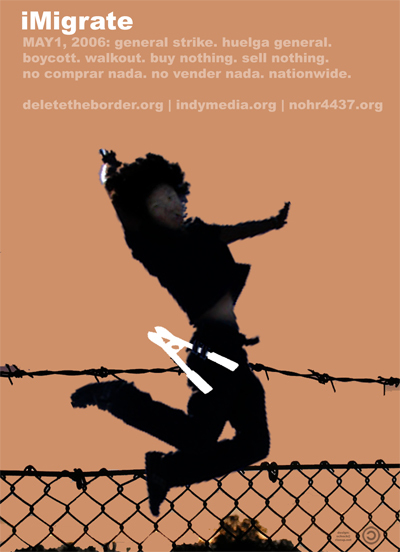 Download May 1 Poster :: .jpg (124kb) :: .pdf (552kb) More :: May 1st graphics from SCAFLA.